I was taking a walk when she caught up to me. I wasn’t going very fast. Just winding up a rocky path. Up ahead, a set of stone steps curved themselves into a hillside and sunk deeply into the earth. She went first. I followed her inside. At the point at which the stairs widened and split, I moved beside her. The only thing dividing us, a thin metal rail. Both of our hands running over it — our guide in total darkness. We climbed the steps together. Perfectly in balance. My footsteps hallowed echos of hers. Her footsteps responding back in the same timbre. 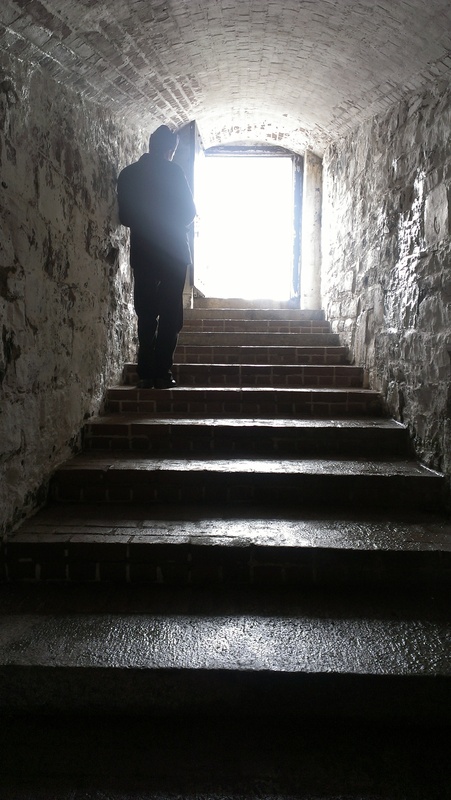 When we arrived at the top we were met by two solid doors, standing shut and glaring back. I tried pushing my body against the one before me. But, it was stuck. My soft flesh no match for this aged concrete. From her door hung a delicately spun spider web. Beaded, drooping pearls stretched across the entry way. She carefully pinched the edges and pealed the web aside, as if tying back a lace curtain. Then, she gestured for me to go first. I did and she followed before letting the web fall gently back into place and closing the door behind us.